It's 2014, and this is what a mining accident looks like. A massive fire reportedly broke out at a Bitcoin mining facility in Thailand last month, devastating all three of its buildings and possibly millions of dollars in hardware. The fire might just be a wakeup call to all the startups trying to mine Bitcoin on the cheap. Details of the fire are sketchy, though local media reported flames raging through a warehouse full of servers near Bangkok on October 14. This week, a photo of the devastation popped up on the forum BitcoinTalk, which identified the facility as one owned by the mining operative Cowboyminers. According to Coindesk, Cowboyminers are a collective of European expats based in Bangkok. Both Cowboyminers and Spondoolies-Tech, the company that made much of the mining hardware in the warehouse, have popped up in the BitcoinTalk thread to discuss the fire. It seems like no one was hurt, but the equipment was uninsured, so ouch. What we still don't know is what started the fire. Spondoolies-Tech commented that the "buildup was definitely not according to US electric code," though Cowboyminers denied that the electrical wiring caused the fire. We've reach out for any additional details. 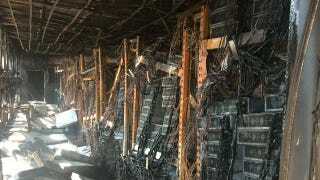 In any case, the fire highlights the possible pitfalls for any Bitcoin mining startup. Bitcoin mining's appeal is its relative simplicity—you just need computing power. But setting up a facility is more complicated than throwing a bunch of hardware together in a room. Every detail of the traditional data center is designed with cooling in mind, from the placement of vents to the hot aisle/cold aisle layout of the equipment. And regardless of how the fire started at the Thai facility, it clearly spread, possibly because of a flammable acoustic foam. A traditional datacenter would have also had sprinklers—or in fancier iterations, gas fire extinguishing systems—that detected smoke or heat early on to minimize the damage. Of course, these systems don't come cheap.